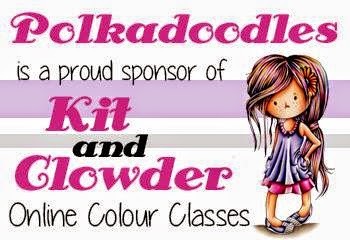 * selected downloads only, includes individual stamps, full kit collections/bundles not included but some older kits are available. If your basket says coupon not valid it is not valid against the item you have added to the cart. Have you seen our beautiful new release ? 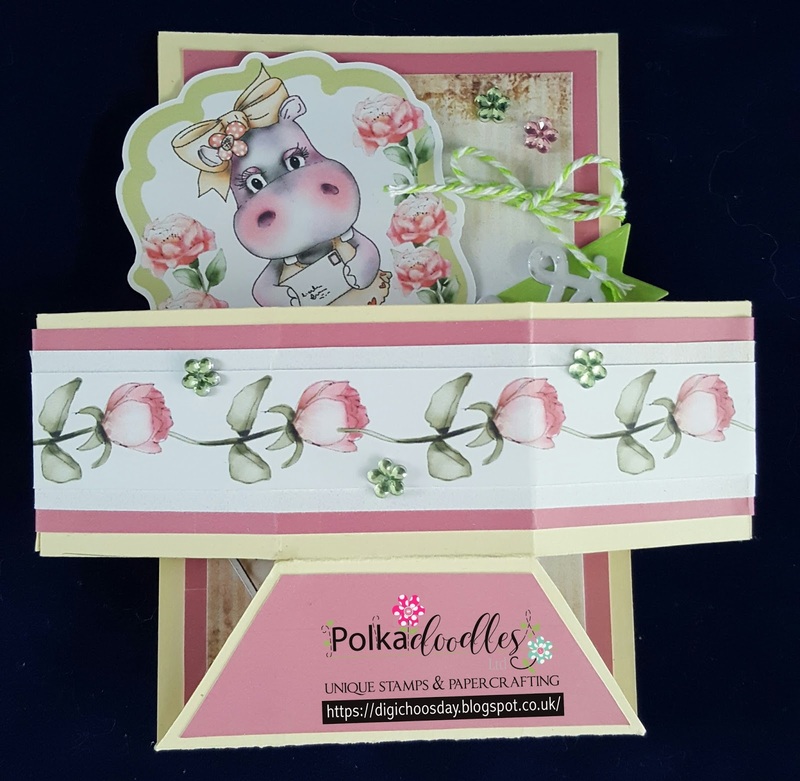 10 Beautiful Spring Flower digis for you either as single downloads or a value bundle and FREE matching sentiments to co-ordinate too! Grab them HERE! CLOSING DATE is 14th March. Our DT call is still open for another 48 hours, but in the meantime we have some lovely new talented people joining us, so welcome Dawn, Hester,P etra, Željka, Julia and also re- joining us is Yvonne. 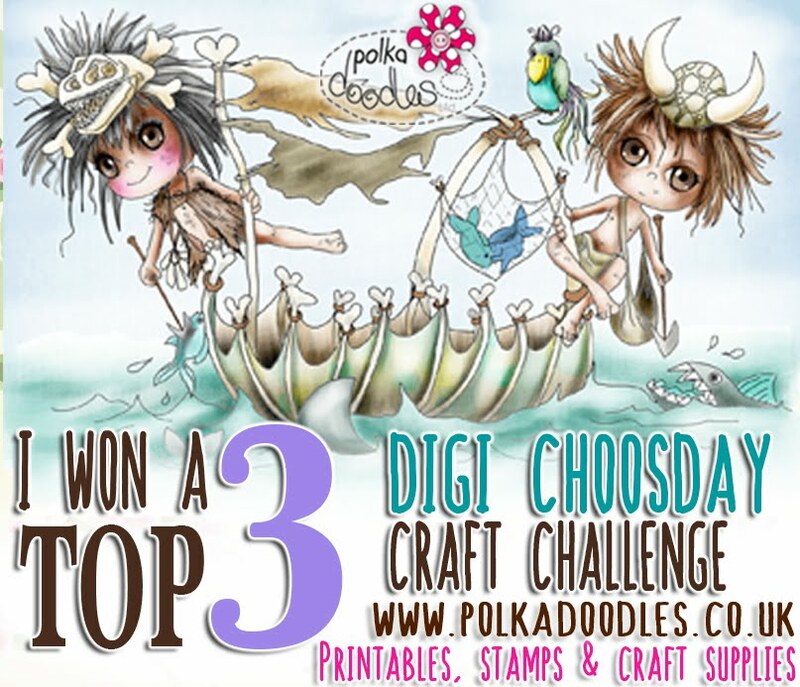 We are all so pleased to have you join us on Digi Choosday! Jane P- For this weeks challenge the Digi Choosday team had to use a designer sheet. Since I have not used the Winston Collection as of yet, that was my sheet of choice. I also incorporated one of the Elegant Nest dies. 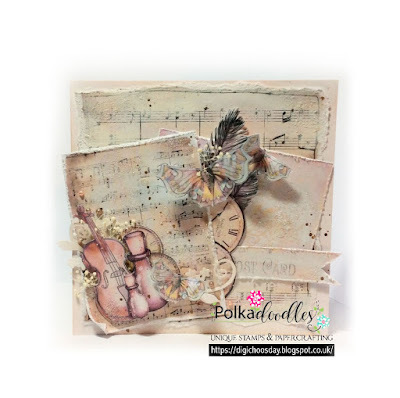 Monica - It´s always easy to craft with Polkadoodles design sheets. 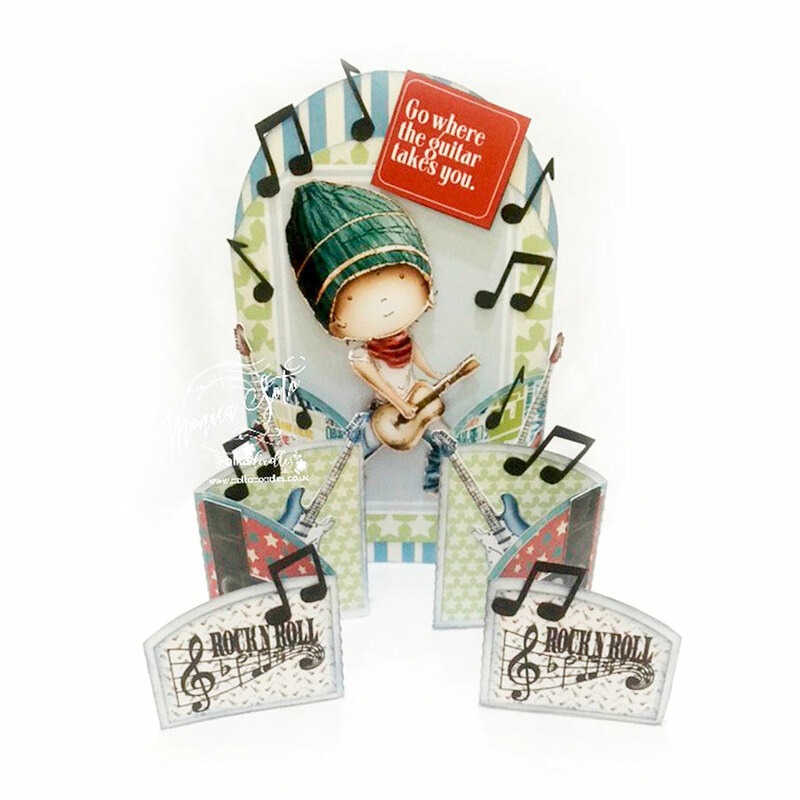 For my card I used design sheet 02 from Work & Play 8.-Feel the Music Collection. 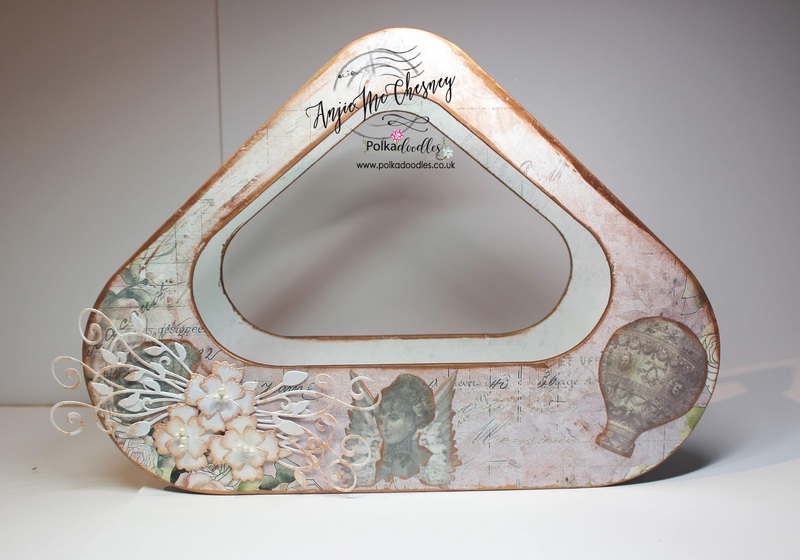 I love this design sheet because the image is already broken in pieces to make decoupage and I really like the dimension I got for my project. 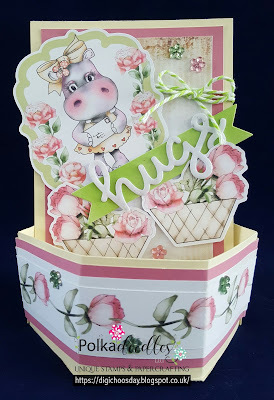 Jane S - I have made a Mother's Day Card using Design Sheet 5 from the Winnie Sugar Sprinkles Collection. Anjie - I used design sheet 2 from the Winnie In Wonderland collection. There are still some bits left over from this, you get so much on the design sheets. Julie - This week the design sheet I have used is from the Helga Hippo collection, isn't she just adorable and I really love the pastel colours. Pauline - I've used a design sheet from the Helga Hippo Download Bundle. I printed the topper a few times so that I could fussy cut her and add some decoupage layers. Everything on my card comes from Design Sheet 9 including the sentiment tag, bunting and flowers, all I have added is a little piece of ribbon, some twine and lots of gems. 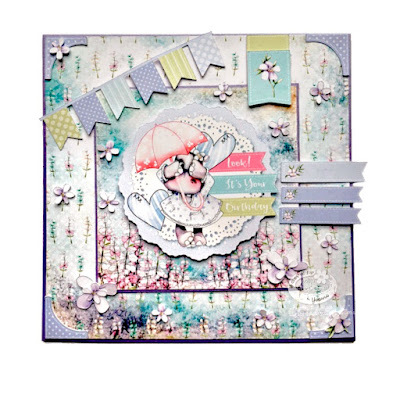 Yvonne - I opted to use the 'Helga' collection, there are so many pretty design sheets on this collection, you can find it here as a digi bundle or here as the CD. I made a 7x7 card and used all the elements from the design sheet as well as one additional paper from the collection. Dawn - I opted to use the Winston Collection. I used design sheet 4. 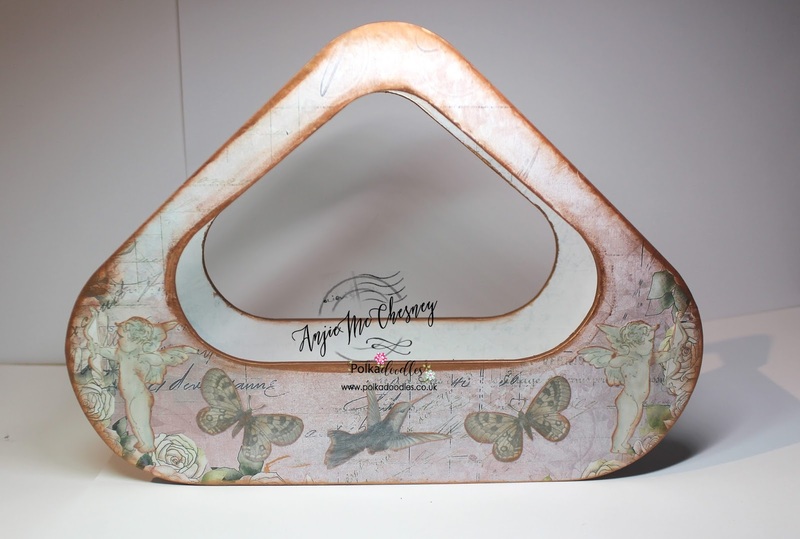 I love this design sheet because the image is already broken in pieces to make decoupage and I really like the dimension I got for my project. Željka-Hello!! !I am so exited! 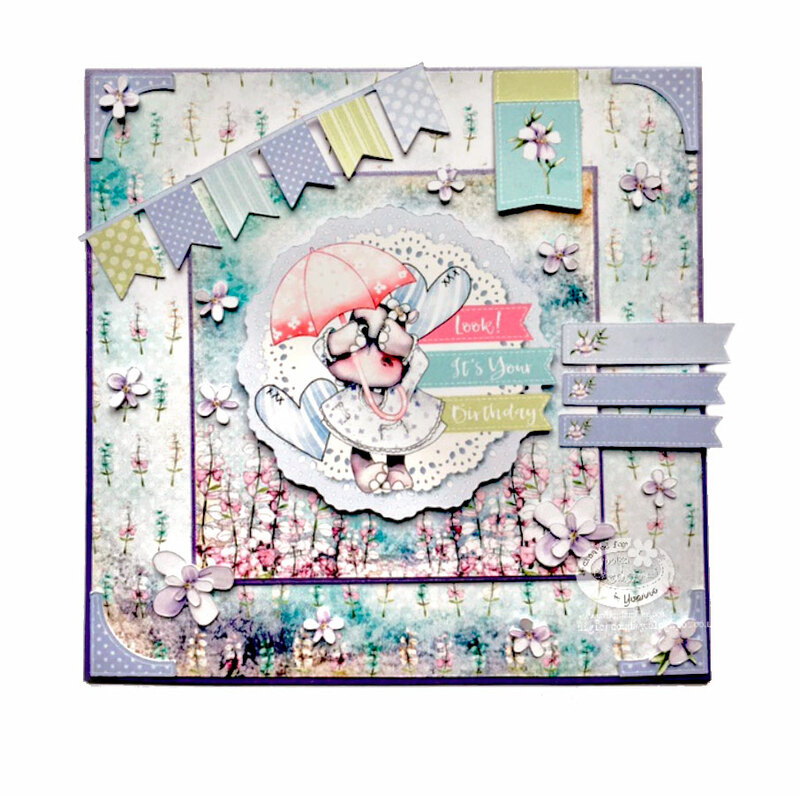 This is my first post for Digi Choosday challenge and I enter with Easel card using Winston Collection design sheet. Hi its Julia here, so excited to be sharing my first DT make with you. This week I decided to step back in time & used a design sheet from the Rosebud collection. Please email us HERE quoting DCW090001 to claim your prize of £5 worth of downloads from the digi store! Pauline - I have used two super images from the Winnie in Wonderland Collection to create my card. I have also used lots of elements from one of the design sheets along with two of the papers and a sentiment. 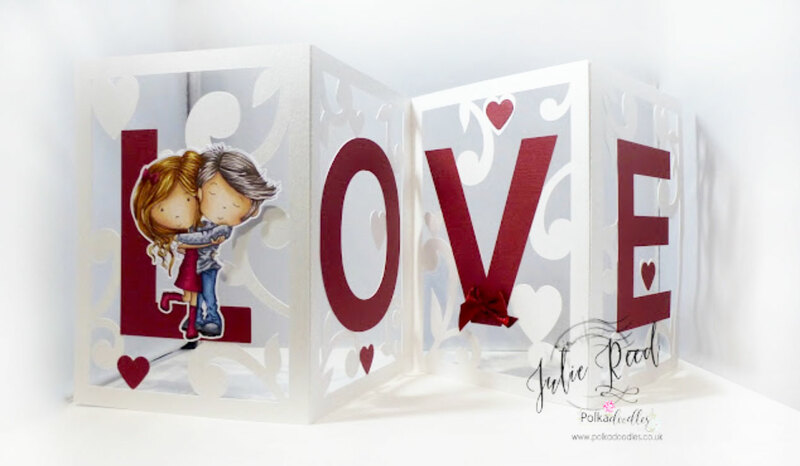 Jane P- I just love the elegance of the Rose Budd Collection and that is the collection I have used this week. Images were colored with Copic markers. 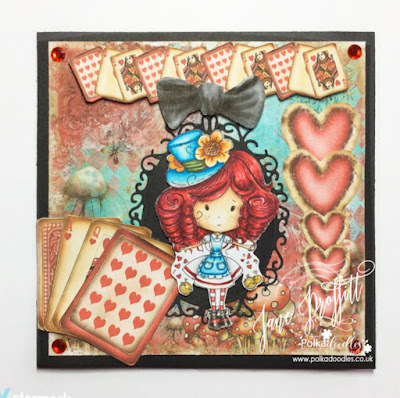 I have also added the Elegant Lamplight/Gate die. Visit my blog today for something special in celebration of my birthday. Jane S - I have used three of the stunning Meribelle Mermaid images for my long card this week, along with paper and a sentiment from the Winnie Starfish & Sandcastles Bundle. 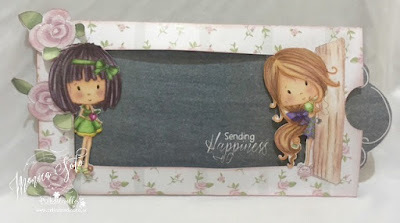 Monica- I made an interactive card using Winnie Sugar Sprinkles Springtime Collection; mixing it´s lovely pastel colours papers with one of it´s chalkboard backgrounds. 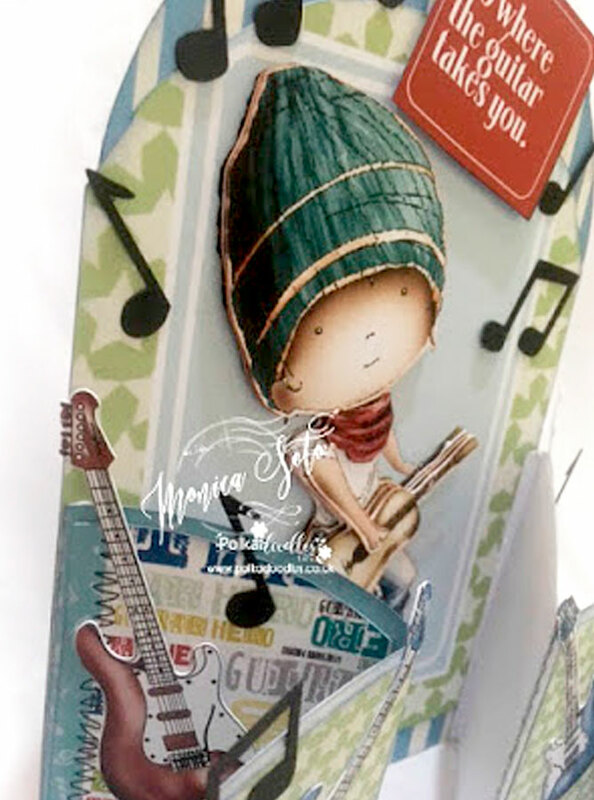 One of the Winnies move along the card to meet with her friend at her house door. 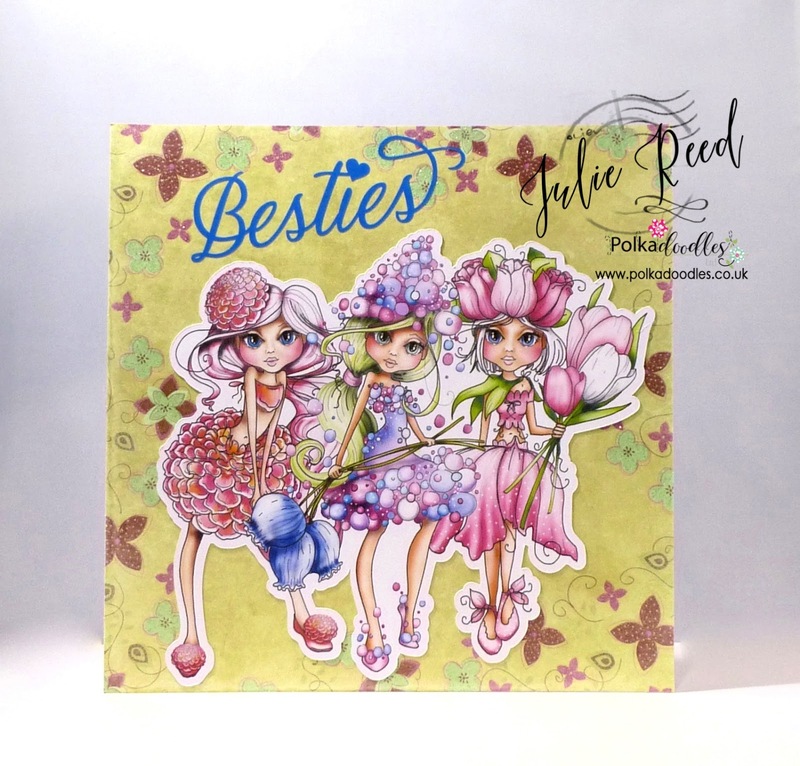 Julie - Work has been super busy for me this last week, so I have made a really simple card, combining three pre-coloured lovelies from the new Darling Buds collection. Anjie - To make this I used the Belle Papillon Big Kahuna collection. 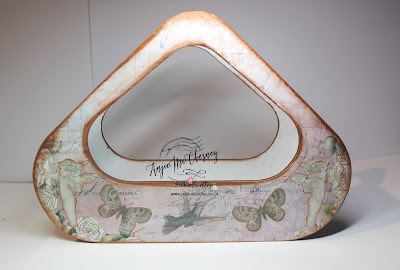 I used some of the papers to cover the MDF basket and used a copper gilding polish around the edges. I then printed out 7 images from the collection and used a distress ink around the edges before gluing them in place. 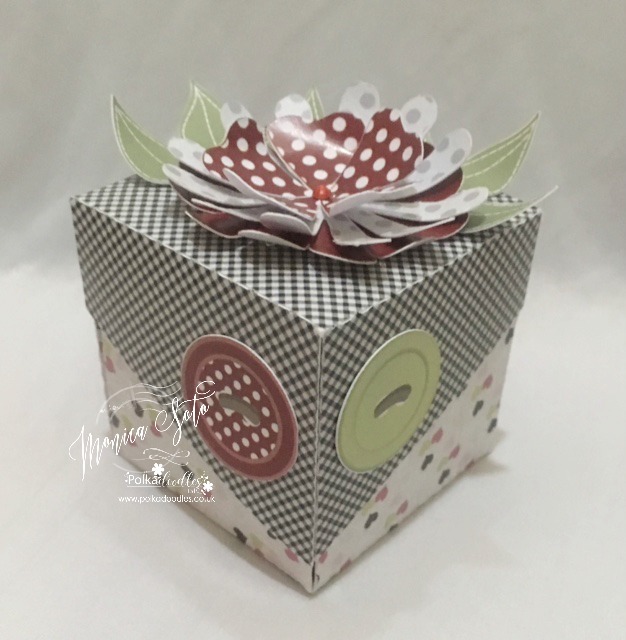 I then used the Flower Flourish Die, and the flowers out of the Bubbleicious Frame die set, to added some interest on the front. Lots more photos on my blog. Please email us HERE quoting DCW080001 to claim your prize of £5 worth of downloads from the digi store! 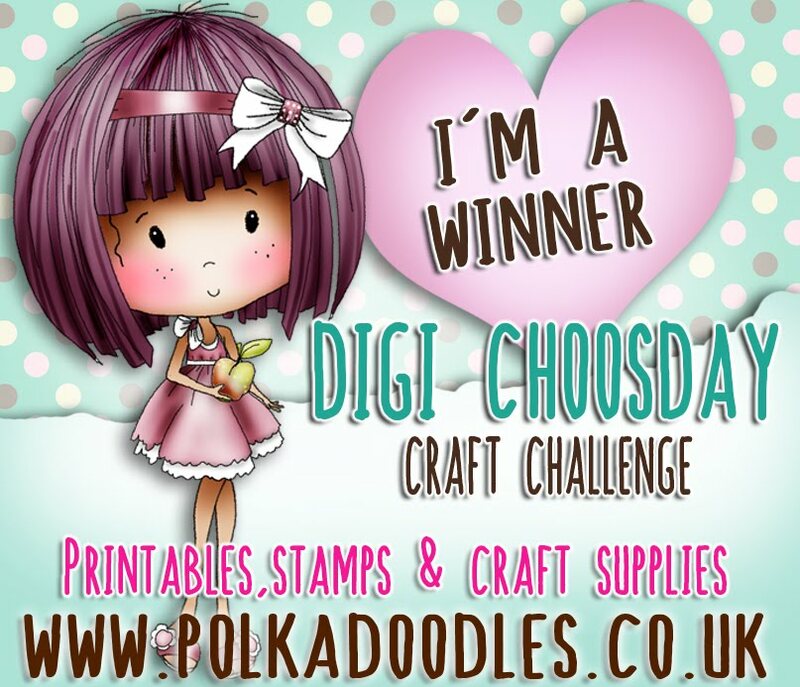 Here at Digi Choosday we need new Design Team members for our lovely fun team! You can be from anywhere in the world. 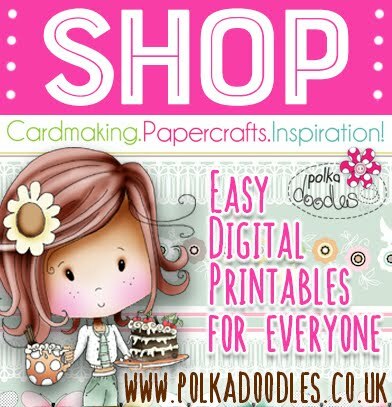 We have an amazing team of creative minds here at Polkadoodles with the focus on TEAM and not ME! We need COLOURISTS AND GENERAL CARD MAKERS! 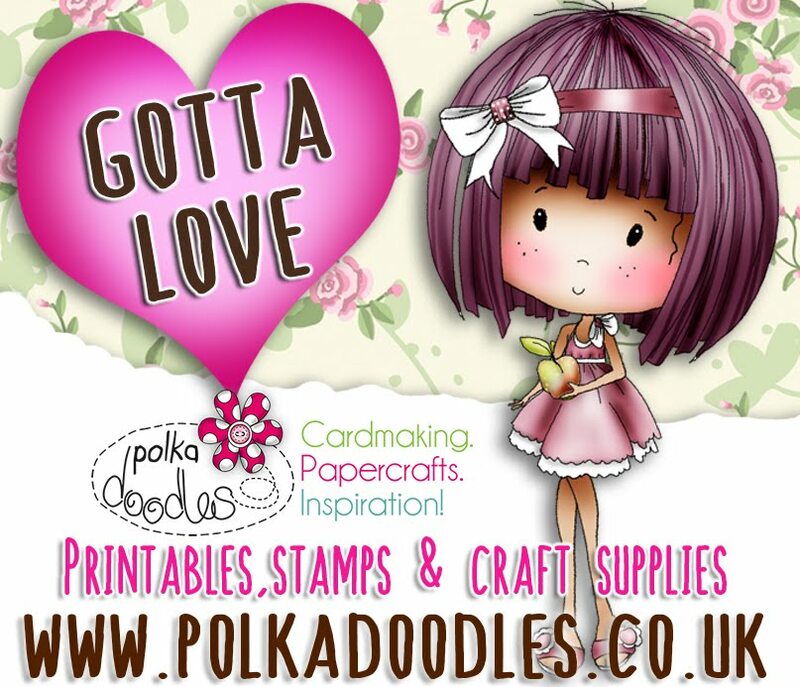 We are looking for good all round card makers who have a flair for what they do, whether you love colouring, using templates to make shaped cards, boxes, mixed media, you love using dies etc - as this is a digital team you need to have a good standard of Colouring skills but we don't mind what medium you use and you can make ANY style of card, we are looking for people who are versatile and like to use different things in their card making, NOT JUST Colourists, so if colouring isn't your thing we still want to hear from you too! The DT is expected to inspire creativity with our challenge followers so you must have good skill levels and be able to produce good quality photographs to showcase your work. 2. WEEKLY blog post, every Tuesday with a requirement to work at least 2 weeks in advance (more is ideal). You are required to link your posts. 4. POST & COMMENT: You must be prepared to regularly engage with the team and commit to rotas for posting and leaving comments on the challenge entries each week, all of which is done on a very organised rota system which includes the use of social media platforms such as Blogger, Facebook, Pinterest, Instagram etc. 5. As this is a digital team you must be prepared to use your home printer to print off digital images, including COLOUR prints of papers/decoupage sheets etc. This is what we do - if you can't print good quality colour, please don't apply. We expect you to use our papers, not your own, we have tons of downloads and this is what you will promote for us. You will be generously rewarded with digital products which more than compensates you for the work you will do for the team. In addition we often have extra tasks which are optional and voluntary, such as being involved in new product launch parties and making physical samples for launches which means your work can be shown on TV. You will be part of a really fun team of fabulous people and will be welcomed and supported all the way. We run a tight ship and we have no room for personal ego's, we're just here to craft and spend our time enjoying what we do and inspiring others. You can read more about our teams HERE, but if you'd like to apply we'd love to hear from you. We will reply to everyone that applies within 3 weeks of the closing date - we look forward to hearing from you! Have you seen our beautiful new release this week? Jane P- Have been reliving my childhood lately and the days that I use to watch the Flinstone's which is why this week I choose to use the Sticks & Bones Collection in making my card. Check out all the details on my blog. 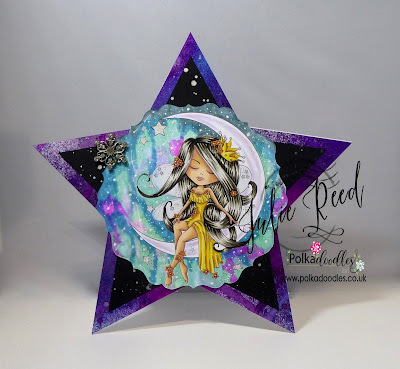 Julie - This week I have been away with the fairies, creating magical backgrounds with my Copics. The image I chose to use is 'Serenity Stardust' from the Serenity Fairy Wishes Collection. Jane S - I have made a rocker card this week with the gorgeous Winnie Fruit Punch Collection and lots of dies!! Monica - It´s Valentines Day and I want to celebrate it with Lily Bug Love Collection. 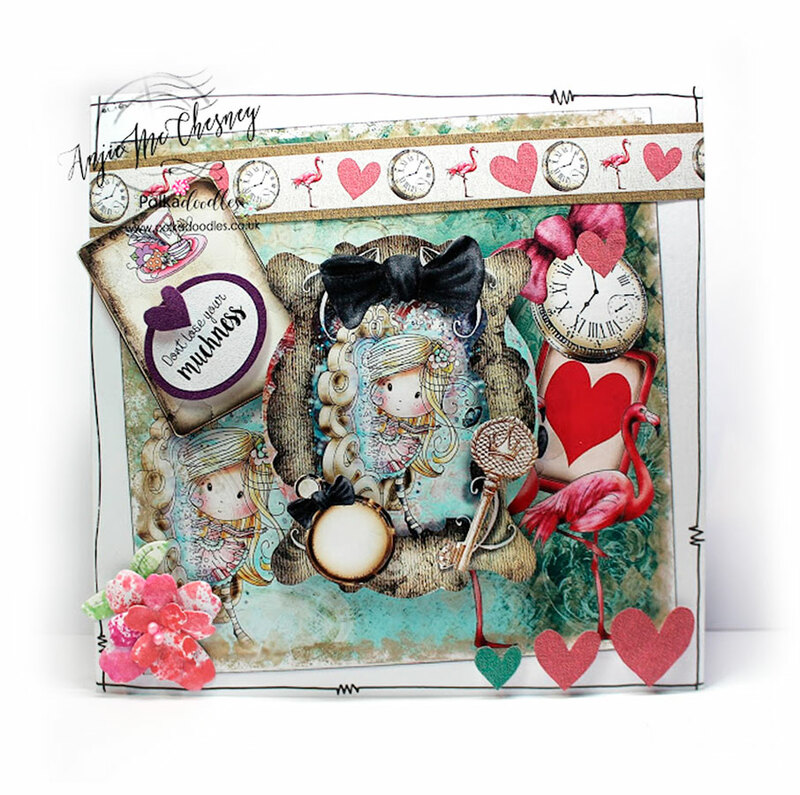 I used papers, sentiments, embellishments and a precoloured image to make a hearts exploding box. There is a chocolate hiden underneath Lily Bug. 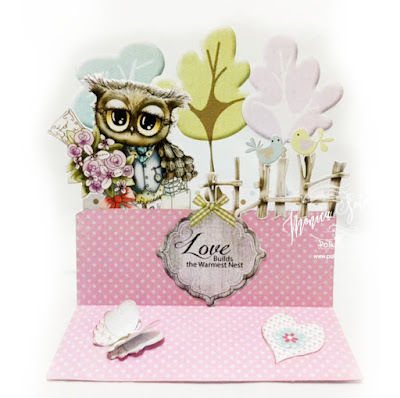 Anjie - I used the ever so cute Lily Bug Love collection to make this CAS card. 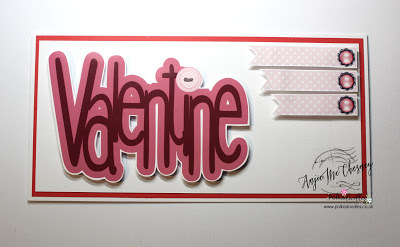 I printed the word art quite large and mounted onto the card using 3D foam, I then added a faux pearl onto the banners and again mounted onto the card with 3D foam. Simple but effective I think. Please email us HERE quoting DCW070001 to claim your prize of £5 worth of downloads from the digi store! 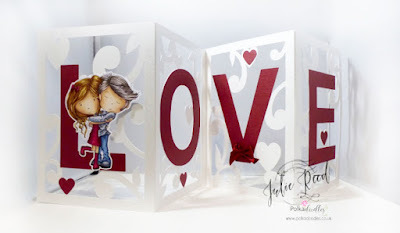 Jane S - This week I have shown some love with the wonderful Work & Play 9 - Love & Kisses Collection! 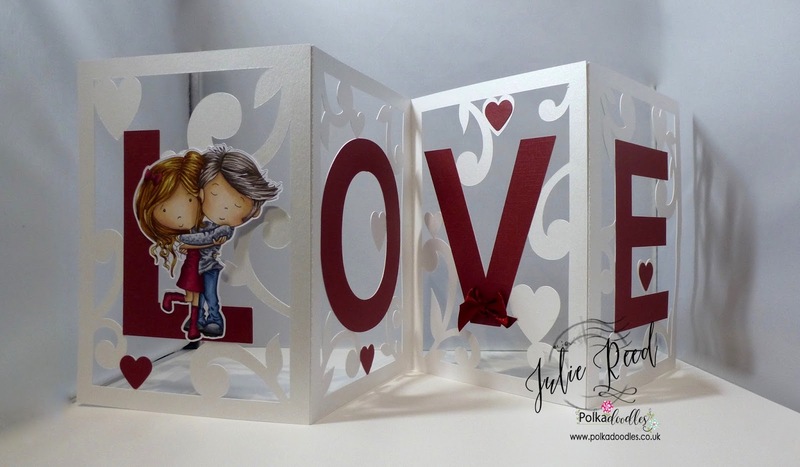 Julie - Love is truly in the air as I have also used an image from Work & Play 9 - Love & Kisses Collection, called 'True Love' and coloured with Copics. Anjie - For this make I used the ever so cute Lily Love Bug Collection. I printed the pre-coloured image onto glossy photo paper at 8cm high so I could cut her out with the Bubbleicious frame die from Polkadoodles. I also printed the love word onto the same paper. I mounted the topper and the word onto 3D foam to make them stand out. I added the red mat to pull out the red from adorable Lily. Monica- When it comes to "show some love" Twiggy & Toots Owls Collection is always the right choice. 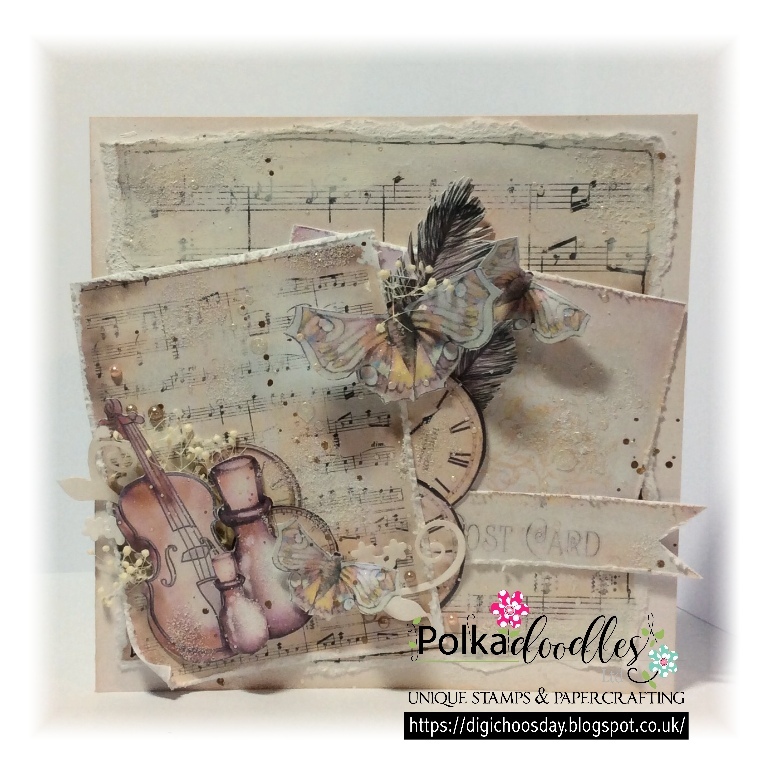 I made a graduated scene card with a lovely Toots precoloured image, embellishments, papers and sentiment, all from that collection. Please email us HERE quoting DCW060001 to claim your prize of £5 worth of downloads from the digi store!